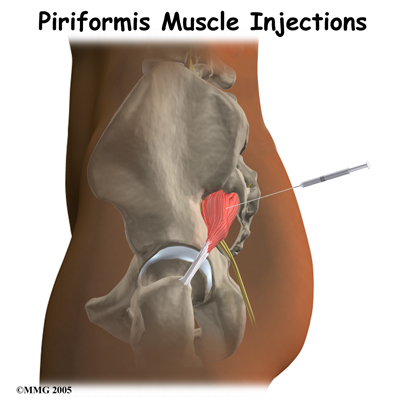 Welcome to Waterdown Physiotherapy's resource about Piriformis Muscle Injections. Cortisone is an extremely powerful anti-inflammatory medication. When this medication is injected into a painful, inflamed muscle, it can reduce the inflammation and swelling. Reducing the inflammation reduces pain. If cortisone is also injected into the piriformis muscle at the same time, you may get several weeks' worth of relief from your pain. This can allow you to get started with or resume a physiotherapy program, which will assist in stretching the piriformis muscle to reduce the contracture and the spasm in the muscle, and strengthening the weaker gluteal muscles that caused the piriformis to overwork in the first place. It is recommended that you begin to see a physiotherapist at Waterdown Physiotherapy after your injection (if you haven’t seen one before), or return for further treatment with your usual therapist if you have already been working with one. 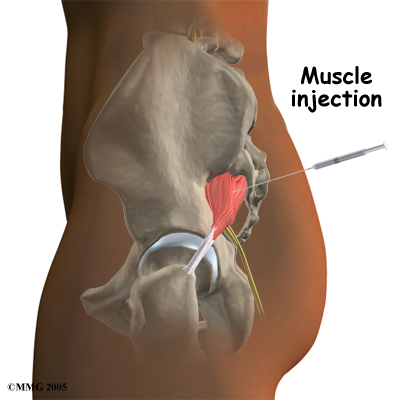 Treatment at Waterdown Physiotherapy after a piriformis injection can begin as soon as your doctor allows it. Each doctor will set their own time frames for beginning therapy based on their personal experience, and also based on how your body has reacted to the injection. If the injection has relieved some or all of your discomfort then, if possible, it is useful to begin treatment at Waterdown Physiotherapy during the period where you are in less pain. This time frame allows your physiotherapist to take advantage of the pain-free period to stretch your piriformis muscle and to set you up on an individualized home exercise program of stretching and strengthening. Your physiotherapist will prescribe a series of stretching exercises for your hip, buttocks, thigh, low back and, if necessary, your calf. 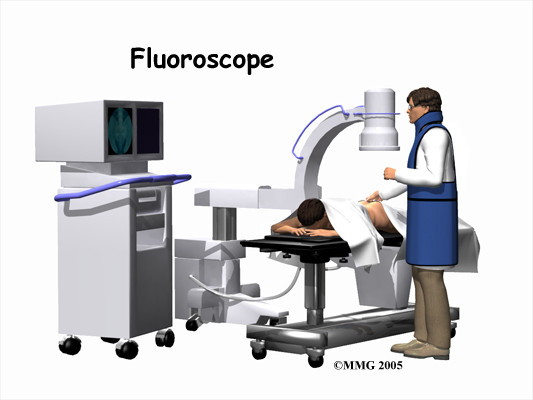 They will also assess the motion of your hip joint. Any tightness in the muscles around the hip and knee or restricted motion in the hip joint itself can affect the biomechanics of the trunk and lower limb, including the tension in the piriformis muscle, so this will need to be addressed. In particular your therapist will encourage you to specifically stretch your piriformis muscle by sitting in a chair or on the ground and crossing the ankle of your affected side over your other knee. By applying gentle pressure downwards on the inside of your thigh of the affected side, while simultaneously sitting up tall (gently tilting your pelvis forward) you will be stretching your piriformis. Your therapist can advise you depending on your individual situation about how often you should be stretching your piriformis muscle and for how long you should hold each stretch. In general doing a long, steady hold of the piriformis stretch will improve flexibility of the piriformis muscle as well as improve the external rotation motion at your hip. Your physiotherapist will also assess the motion in your lumbar spine and pelvis as well as the ability of your core muscles to control the trunk. 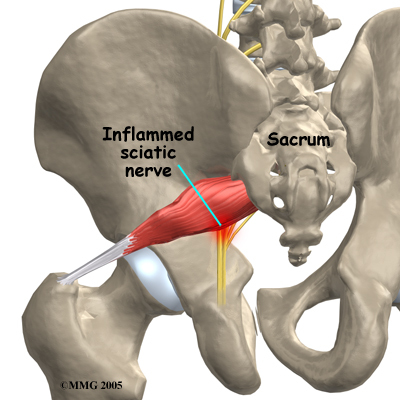 Due to the close proximity of the piriformis muscle to the low back area as well as the relation of the spinal nerves leaving the low back and then forming the large sciatic nerve (which, as explained above, passes near or through the piriformis muscle) this area needs to closely be assessed for its contribution to your dysfunction in the piriformis muscle. If your low back is stiff or degenerating at the joints this can irritate the nerves in the low back or alter the biomechanics of the spine causing the piriformis muscle to become tight. Alternatively a loose (hypermobile) low back joint can also alter the biomechanics of the low back and trunk causing the piriformis to tighten. 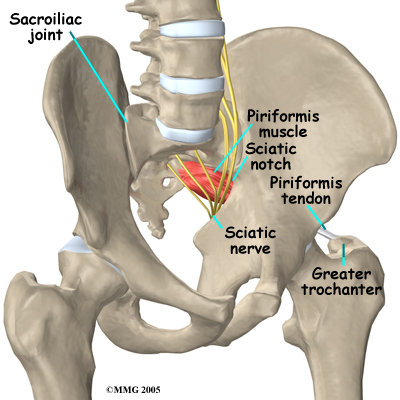 Often by changing the overall biomechanics of the trunk and lower extremities the piriformis muscle is relieved of excess strain and your pain eases. You therapist will provide advice regarding your individual biomechanics and how you can improve them in your daily activities of work and play. Having a weak core muscle area can have a similar effect on the lumbar and trunk biomechanics as a stiff or loose lumbar spine and can also lead to pain in the piriformis muscle. Core-strengthening exercises will be crucial to your rehabilitation after a piriformis injection. Your therapist may start these exercises by first just teaching you how to activate the deep muscles that support the spine and trunk. This is done by gently pulling the muscles inwards as you sit or lie on the bed. Pain and injury can make these muscles much less effective and difficult to activate so learning to use them may not be easy at first; the feedback from your physiotherapist regarding technique will be crucial. 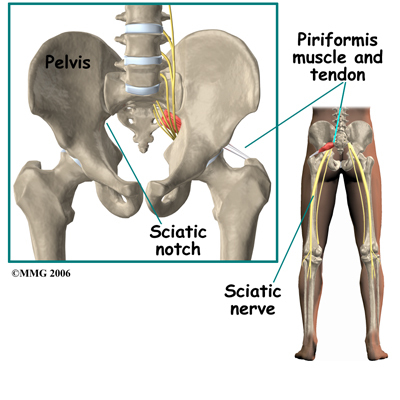 Generally the rehabilitation we provide at Waterdown Physiotherapy after piriformis injections goes very well. If, however, your therapy is not progressing as your therapist believes it should, we may send you back to your doctor for another consult regarding further management of your pain. It is important to remember, however, that injections are not usually a cure for your pain; they are only a part of your overall pain management plan.